"The Fourth of July can be viewed as either a gigantic headache or a nice break from all the rehearsing day in and day out. For members of the Crossmen front ensemble, it's a pretty fun time. 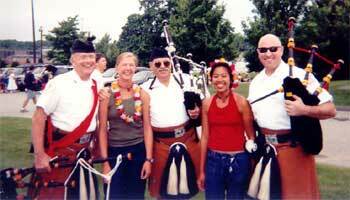 This is a picture of me (left) and Patty (right) chillin' out with some wicked cool bagpipers before we head out to be watergirls for the rest of the corps." Thanks!